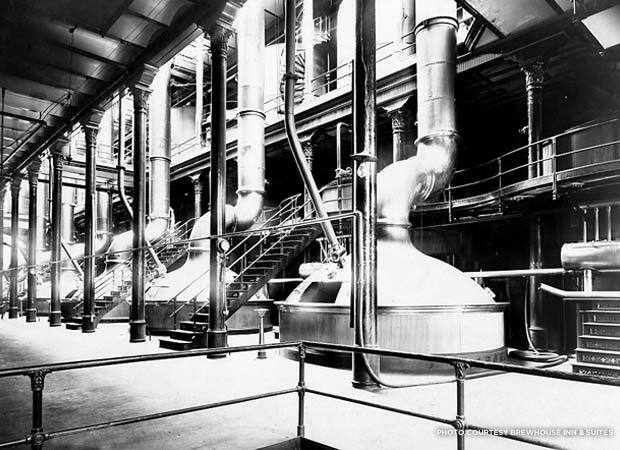 The Brewhouse, part of the original Pabst campus, built in 1892. Milwaukee is a hard-nosed town. It was built on heavy machinery, third shifters, and the no-nonsense beer they drank after the whistle blew. And though decades of decline had left the city largely stale and generally unpalatable, Milwaukeeans -- true to form -- brewed up a solution and followed a cue from one of their city’s icons, Pabst Blue Ribbon: They started to take old Milwaukee and make it cool again. 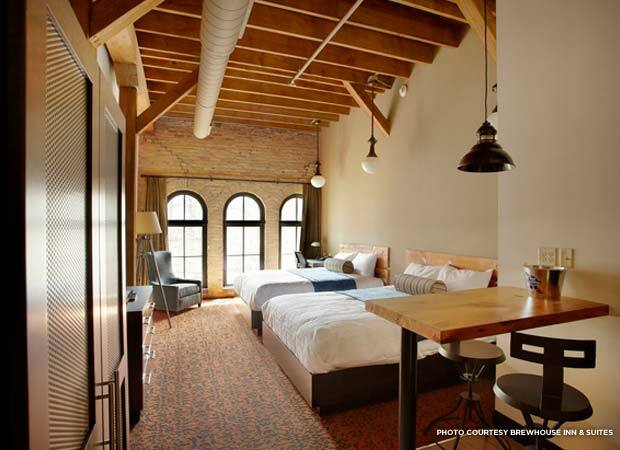 Much of the development, including four hotels, is based on adaptive reuse of historic buildings, and it just so happens that the latest and maybe best example is the Brewhouse Inn & Suites, a 90-room boutique hotel that opened this April in the 1892 building where PBR was born. 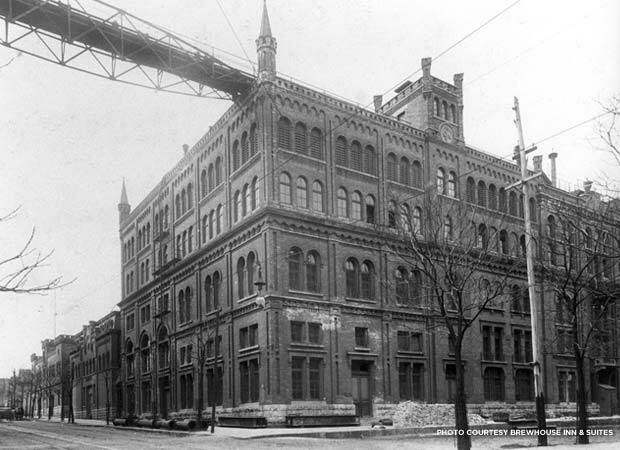 Part of a massive development project on the 20-acre site that was home to everything Pabst from the late 1800s until the company pretty much picked up and walked out of town in 1996, the Brewhouse is the centerpiece of the former Pabst campus. Preservation tax credits were used extensively to help fund the restoration and repurposing of the National-Register listed building. 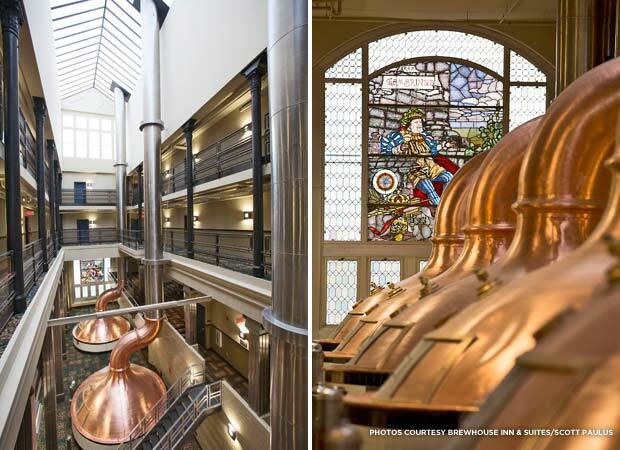 Everything from the six massive copper kettles in the building’s five-story atrium to the late-1800s stained-glass window of the patron saint of brewing that sits above them still remain -- not to mention the metal beam work that still sports the Carnegie Steel stamps and the exposed cream city brick walls throughout the building. The entire 20-acre campus surrounding the hotel, which also includes apartments, the University of Wisconsin-Milwaukee’s Zilber School of Public Health, and other ventures, is LEED-certified. The hotel itself, which started construction in 2011 and finished with a price tag of roughly $20 million, made the headboards for its beds out of lumber salvaged from the building. Same thing with the tables in the soon-to-open bar and those in the kitchens of the hotel’s extended-stay rooms. Before the development of the old Pabst campus began, the area was 20 acres of abandoned buildings. Now, with the Brewhouse opening, about 70 percent of that land has been developed and there are plans for the remaining buildings. Renovated hotel room within the Brewhouse campus. Cream city brick is visible on the far wall. But for all the excitement about the hotel, the former Pabst campus, and Milwaukee’s future, the city’s unique past isn’t lost on anyone, least of all Northard.